I’ve never met a brownie I didn’t like. Wait. Scratch that. I have met brownies I didn’t like…dry ones. Ashes to ashes, dust to dust brownies. No thanks…but gooey brownies. Yeah, buddy. Come to Mama! Y’all told me on Facebook you wanted me to start posting coconut flour and almond flour recipes…and I’m happy to oblige because that’s mostly what I find myself using these days. I love both of them – they are different, but I love the taste and texture. Hello? Are you there? I know some of you just phased out everything I said once the word “brownies” came out of my mouth. 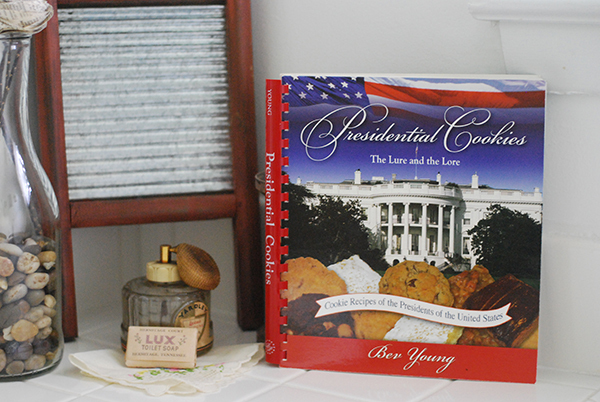 This week in Cooking Through Stacy’s Stash I’m using a cookbook from Washington, DC – The Presidential Cookie Cookbook. I’ve been to DC a few times and I love it each time – so full of history and great FREE things to do. I bought this book on a trip with Barry. Cookbook + cookies? I’m sold. I love this book because it’s got a cookie from the time period of each president – with facts and little informational tidbits. I love informational tidbits. If you’re a homeschooler, this would be a cute book to use when talking about the presidents – and then you get a cookie. Win-win situation here. 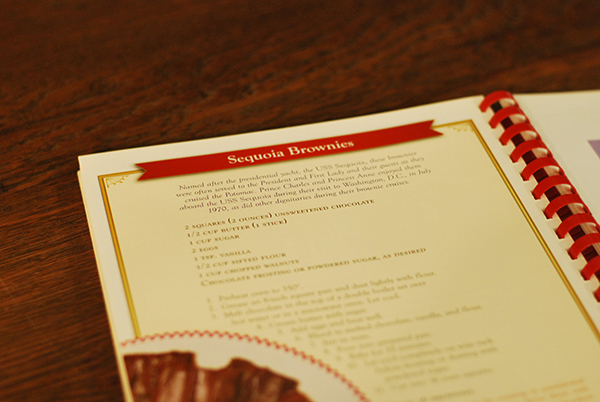 I chose this recipe for Sequoia Brownies for one reason and one reason only…it said BROWNIES. This cookie is from the Nixon administration and is named after the USS Sequoia. I didn’t have to change much, I just mixed it up to make it more Stacyfied. A guilt-free brownie? Yes – you can be my best friend. Wait, what? Did you say BROWNIE? These were totally amazing – they will be a regular dessert around here. Yes, you can be my friend. I’m so glad when something I tweak turns out good – sometimes I’m not so lucky. Keepin’ it real. Almond flour and regular flour cannot always be used interchangeably. It depends on the recipe – sometimes it totally flops. These did NOT totally flop. Coconut flour is its own beast…it takes a bit of tweaking because it’s a very protein-rich flour – it needs a good binder. But, we’ll talk more about that in another post.. Grease an 8 inch baking pan/dish. Preheat oven to 350 degrees. In a small saucepan, combine butter and chocolate. Warm only until melted. Cool slightly. Add sugar, stevia, eggs, vanilla, salt, soda, and almond flour. Stir well. Bake for 30 minutes or just until edges start to set. Do not overbake. Ashes to ashes, dust to dust brownies are yucky. I just discovered you! 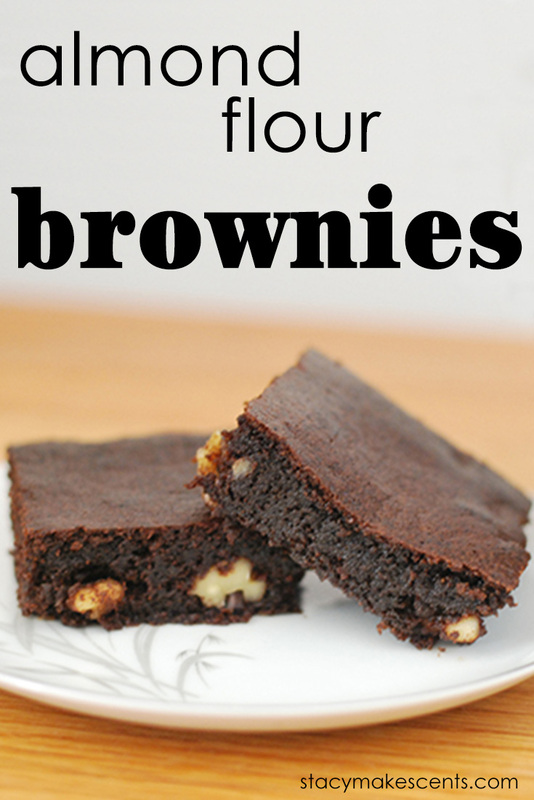 I want to try these brownies so bad however my husband and I cannot use Xylitol. I have Truvia and THM Gentle Sweet. Which one of these could I use and how much? I want the brownies bulk up. I am so sorry for the late response to this wonderful comment! We’ve had an issue with SPAM eating all our juiciest comments!! Thank you so much for taking the time to comment – I would honestly recommend you trying both to see. It is always tricky with sugar substitutes. It’s all about your preferences to flavor and texture! Thanks again! These turned out great. We substituted sunflower seed flour which you can easily make in a Vitamix or coffee mill for much cheaper. I often use this to make gluten free chocolate chocolate chip muffins. I’m not super familiar with the Keto Diet. But good substitution for sugar would be honey, maple syrup or just add Stevia to taste. Bakes this morning! Turned out amazing!!! I did not use Stevia and I used organic coconut sugar plus walnuts. I also used 90% dark chocolate. OMG I will never make other kind of brownies ever again. Thanks for the comment, Heather – I’m so glad you enjoyed the brownies. Mine where extremely dry. I baked 5 minutes less but still dry. What can i do. they were also like paste when putting in pan , not pourable. Maybe we used different types of almond flour? They should be very gooey. Try adding a bit more liquid. This looks awesome! How much swerve can i use instead of all xylitol? Thanks! I don’t have much experience with Swerve – I think on those packages they tell you how much to use. Xylitol is cup for cup when using in place of sugar. What kind of almond flour did you use? I have blanched and unblanced. Thanks! Salted or unsalted butter? These look great, but I’m trying to bake without real sugar. Can I use 1/2 cup of truvia instead of the 1/2 cup of sugar? It might effect the thickness – but you could try it. You could also try using erythritol or even xylitol. Don’t know how old this post is, but I have to ask. Instead of using chocolate bars, can I use cocoa powder and add some liquid to it? I’m not sure, Robyn. I’ve never tried it that way before. Made these brownies today! Wow, best guilt free brownies I’ve ever made! Thank you so much for the recipe!!! Will definitely make again! I only baked for 20 minutes and they turned out perfect. I might even bake them for 18 minutes next time because I like the center a tad more gooey? Maybe my oven cooks faster than most! Haha. Thank you again!! Oh my yes! Gooey brownies are where it’s AT! I just made these last night and did not have any stevia. I think they tasted great! Then again, I used Truvia that I had on the shelf and have never used. I usually sweeten with Splenda but saw that Truvia really is Erythritol. Either way, this recipe is a real winner for me! How much of truvia or thm sweet blend do I use?? I don’t have xylitol. What does using xylitol AND stevia do? What if I left out the stevia? They would be very bitter. Most baked goods need the bulk that sugar provides – so that’s why I have used a bit of xylitol, for the bulk. The added stevia is to make sure they are sweet enough. These look awesome! Do yo think you can use truvia in place of the xylitol/erythritol? It has the consistency of sugar but I wasn’t sure if the xylitol was thicker. Thanks! You cannot use them in the same amounts – Truvia is much sweeter than xylitol and erythritol. This was JUST the recipe that I was looking for! Can you let me know what the nutritional info is on it? Thanx! I made them again over the weekend – man….I love them more every time! Made these today to have at my son’s birthday party while everyone else was eating cake. YUMMMM! Did not feel like I was missing out at all. Thank you thank you!!!! I made them this weekend too! In the oven now . . . . I noticed xylitol is a bit thicker granuals. Is this normal and how it should be used in this recipe? I have the “Now” brand. Hope its a good one. I just sub xylitol one for one with sugar. Are you asking me how to make it without the stevia? Because it calls for 1/2 cup xylitol. Oh no no, I am THM so I will be using the xylitol. I’ve just read about people “grinding” it first and I wanted to be sure that I didn’t need to do that for the brownies. No, you don’t need to in a recipe like this. You have to grind the Truvia or Xylitol to make things like Skinny Chocolate – recipes where it won’t be able to dissolve. 🙂 You’re safe here. No! Not wonderful-looking brownies! Why do you do this to me? These brownies look indescribably delicious. Now I have to make them and eat perhaps half the batch on my own. I made your brownies, they are excellent!! I look forward to trying more of your recipes! I also would like to thank you for making me aware of the book Trim, Healthy Mama. I have ordered it and am looking forward to getting started! You could try – that’s what the original recipe called for. 🙂 You might have to adjust the liquid amounts…you’re look for brownie batter consistency. Good luck! This is TOTALLY happening here as SOON as I get my hands on some almond flour. I’ll be right over..when you get that flour. I love brownies so much. And it is cookout season, with which they compliment perfectly. 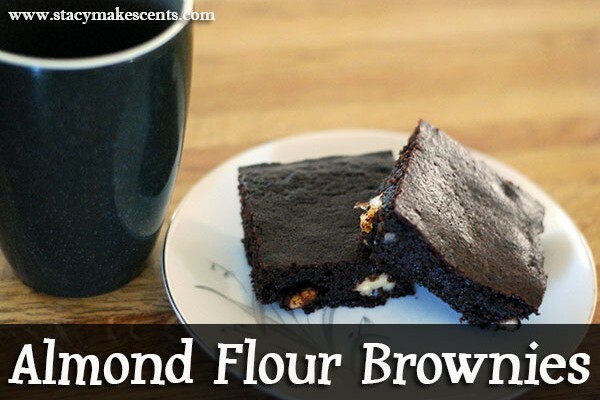 I don’t have almond flour…I suppose I can make these with wheat flour? Thanks for linking to Wellness Wednesday. Gotta learn something new every day, right? 🙂 Thanks for hosting! I love how you blend the recipe with some learning 🙂 Absolutely wonderful! Thanks so much for linking up with Mouthwatering Mondays! 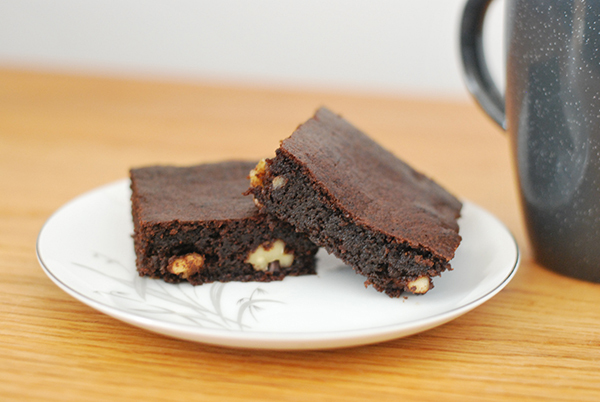 These are great looking Brownies! Thank you so much for sharing this great recipe with Full Plate Thursday. Hope you have a fabulous week and come back soon! These look amazing! Thanks so very much for linking them up at Weekend Potluck. Please come again soon. 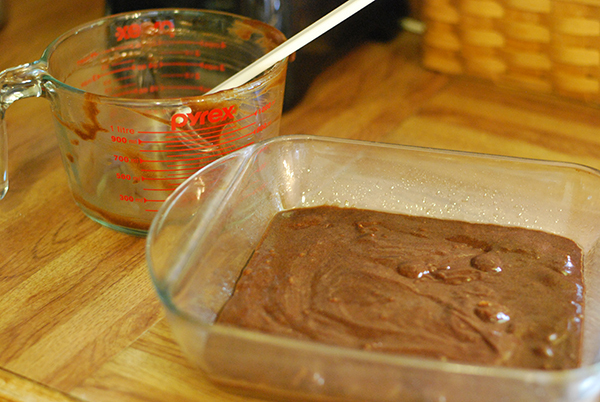 I’ve never tried it that way – most brownie recipes need the bulk of the sugar to work out. Do you have protein powder? You could use a couple scoops of it for the bulk and then just use the equivalent of 1/2 cup of sugar in the stevia. I like the sound of that cookbook, and your brownies look scrumptious. I like how you have made them a bit healthier, and I always enjoy using almond flour, both for flavour and texture. I’ve pinned this recipe to the Hearth and Soul hop recipes board. Thank you for sharing it with us. Thank you for hosting another week! I love baking with almond flour it is very traditionally used in Mediterranean baking. I hope you saw #21 from the foodie friday party it is an paleo strawberry almond coffee cake… I think you would love it. Thanks for sharing your delicious brownies with us. I love almond flour; it rocks this earth! I used to make my mother (The Simple Homemaker) almond flour cookies that she worshiped. (Not literally). This recipe looks so awesome; awesome as in “I can’t live the next year of my life without making them at least once.” Thank you! LOL Hannah…you and your Mama make me smile. The recipe looks great, though, I’d just need to make it with sugar! It was a blessing to see this cookbook picture posted. I have a copy that belonged to a friend that died a few years ago. She let us try the lemon squares a few weeks before her death. I’ve made those too! They are very good. 🙂 So glad this brought happy memories. Thank you for visiting my blog at Gluten Free A-Z ( riced cauliflower) and leaving a comment. I came over to visit yours and discovered your healthy blog carnival that I didn’t know about. I’ll be there participating next Tuesday. Really enjoyed your site. Thanks, Judee! 🙂 I’m happy to have you here. Those look yummy – definitely going to have to try them! Love the muffin in the mug idea but what is the alternative if you don’t own a microwave? I really want to try it! I bake mine at 350 for about 15-20 minutes. 🙂 Easy!! They taste great too! Wish I was eating one right now. I don’t even care that it’s too hot to turn the oven on. These brownies must be made. I currently am in my kitchen and it’s 80 degrees outside. I have the oven, crock pot, and stovetop on and I’m sweating like a pig. LOL But I’m having fun!! We have that cookbook and those brownies are awesome, although I’ve never tried them the THM way. Can you use peanut flour instead of almond flour? I have never done that…when I use peanut flour, I usually just use it as part of the recipe and not the entire amount of flour. These sound fabulous! I like to use xylitol, too, but I really have to watch my portions VERY carefully, or I get a gassy tummy. Although these brownies just might be worth it! LOL It’s probably a good thing that I don’t have the ingredients in the house or I might be making these instead of washing the kitchen floor. Wait – you choose to wash your kitchen floor instead of make brownies? Dawn honey, I think your priorities might be screwed up. Has our grocery bill gone up? Yes – but that’s not because of THM…it was going up before. Because we’re eating more high quality items – that was a decision we made before we even started THM. I do buy coconut and almond flour but I don’t use them very often – maybe a couple times a week…when we were eating wheat, it was almost EVERY DAY. Yikes. Stacy, we use xylitol in small amounts here, because it definitely gives us intestinal upset, and our guests who come over to our home and aren’t used to xylitol in any way also get intestinal upset from it. If I were to sub erythritol for the xylitol, I wonder how much of it I would use instead? Julieanne, I would try it in the same amount as the xylitol. I haven’t done that with this particular recipe, but I have done it with a couple other successfully. I use almond flour a lot in my cooking since it’s gluten free. These look great! Thanks! They taste pretty stinking delicious. wonder if i could use maple syrup for our sugar? The additional liquid might change the consistency – but you could try it! Thanks for another opportunity to link up, and a double thank you for featuring my coconut macaroon muffin in a mug. I hope you enjoy it when you get a chance to try it. I added my raspberry cheesecake rollups today 🙂 . Stacy, I had just ordered some xylitol when I put in an order for the truvia making stuff that you had posted about a while back. Not sure why I ordered it, but now I do…I can make brownies! My DH will be soooo delighted. He does like his sweets…. I really enjoy and value your blog. You are awesome! Make sure he doesn’t eat the whole pan…laxative effect and all. LOL He might think you’re playing a dirty joke! LOL LOL Okay, I’m cracking myself up here!!! Thanks for the article AND all the great recipes you posted yesterday,I am still going through all of them. I do have a question about the xylitol. Is NuNaturals different than xylitol? I am having such a hard time with the sweeteners. PS, one thing that always comes up on the fb group is how to AFFORD the THM lifestyle, I always point the questioner to your website, but I (and MANY others) would love to see a writeup of what you get, where, and maybe buy prices and YOUR essentials for THM! Just an idea 😉 Thanks for all you do! Your blog is a go-to guide for THIS former coupon queen turned THM! Well, then we’re two former coupon queens here. 🙂 Nice to meet you and thanks for the referrals! I’ll add those ideas to my queue. Thanks! I cannot WAIT to try these! Looks delicious, yet again, Stacy! 🙂 Thanks for linking up, girl!